Very easy.. Get one pack of Gits Uttapam from Desi store. Open the pack, empty contents into a bowl, add the amount of water stated on the packet, add a couple tablespoons of yogurt, mix well, add quarter spoon salt.. even better if you make this batter the night before. Now chop onions (preferably spring onions), finely chop a small tomato, finely chop a quarter of a cucumber, shred half a carrot, finely chop half a capsicum (green pepper), get some green chillies too, mix any of these you like or all of them. Add all these chopped veggies to the batter and mix well. Heat a nonstick pan, add a few drops of oil.. take a small cup and spread the batter in a circular motion (this is half the trick).. and after some time cover the pan to let the pancake swell up.. now flip to the other side.. till slightly brownish. Serve hot with Sambhar/coconut chutney. 1 Gits packets should make about 5/6 medium size uttapams good for 2 people. See the picture I clicked. am proud of myself. for more questions ask Rakhiji. Last edited by sarv_shaktimaan; January 15th, 2011 at 10:51 PM. Jo packet ke pichhwaade pe likhele ko kyu chhep riyaa hai? Create your own recipe, something from scratch like last time you posted. Uttapam samjha, lekin ye sambhar + chutney kidhar se laaya? uske baare me bhi khulasa karna chahiye..
lo saala.. waat laga daali amtha pai ne. mere ko laga koi shabbashi dega. nah, you did good. Even to get the right shape of the dosa is an art. So, you did good. Even to get the right shape of the dosa is an art. .So, you did good. 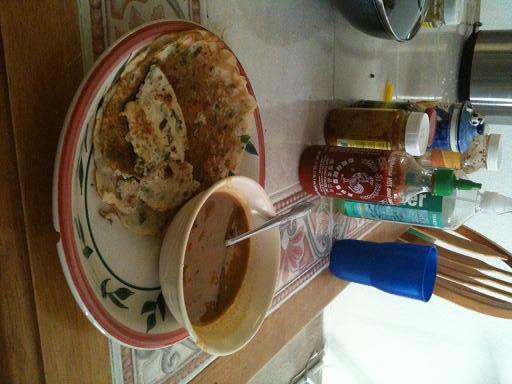 so I am all you made dosa or uttapam.. Calling an Uttapam a Dosa. Abe... jabardast recipe che... ab gits ke uttapam ko gits ke method se nahin to kya traditional method se banaoge. ignorant gujju.... it's a pizza and a pie thing. same thing with little a difference. Gee! when did you guys become so technical about the terms? Dosa and Uttapam pretty much sem sem just like dhokla and khaman are sem sem. See... Rakhi tai... these people have never interacted with southies ... ask me, for last 3 yrs I'm living with them. During which years you stayed in Bangalore and why? And how did u conclude that? Coz i cooked uttapams? No... coz the shape of your Uttapams is round! You yourself said so. Now answer to my question.